Absolutely gorgeous. 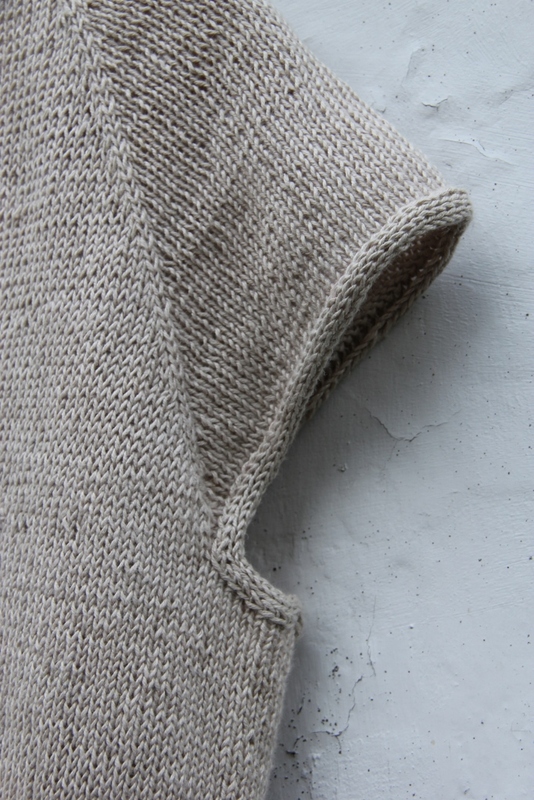 And although you’re right about the mind-numbing endless stockinette, it is well worth it. It makes me want to wear it just looking at it! Very well done! my counted knitting always gets stuck for weeks/months too, although in recent weeks I have started getting a curious urge to knit a lace scarf from some Shetland wool that I have been spinning and plying recently. Knowing my brain it might be a very bad idea, but I may need to give it a go anyway, one can always hope that this time, it will be different…. The red version of Clearwing did not end up suiting me at all, the sizing is all wrong so it’s going to get frogged and hopefully, one day, it’ll come back in some new reincarnation. I make deals with myself, so for instance the scarf I’m making for my mum, is a 4 row repeat (+ purled ws rows), so I say that if I just make one set, I’ll be further than before, and not get bored and hopefully not talked at. But doing it like that also makes me forget that I even have it. I started it in Dec. last year, then SO could not stop blabbing over xmas and I just never got started after that. Began again early summer, then he had 3 weeks summer holidays and well…. Yep, and not so many plants to look after/pick! Very, very pretty. I also love the natural colours and the rows of stockinette (only to be surpassed by rows of garter stitch). 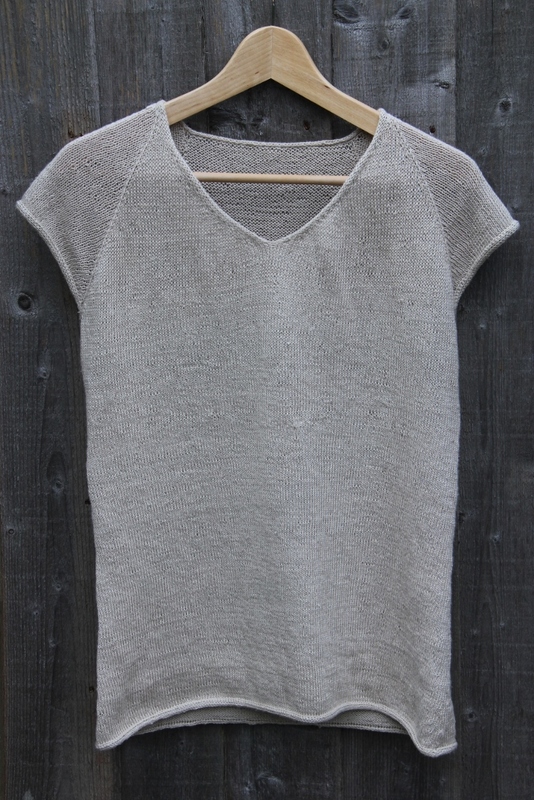 Thanks for the review on this linen yarn—it’s hard to find one that is so nice to work with. I agree simple stitch patterns often work best, they let the yarn shine. How lovely that looks, and what a classic design. 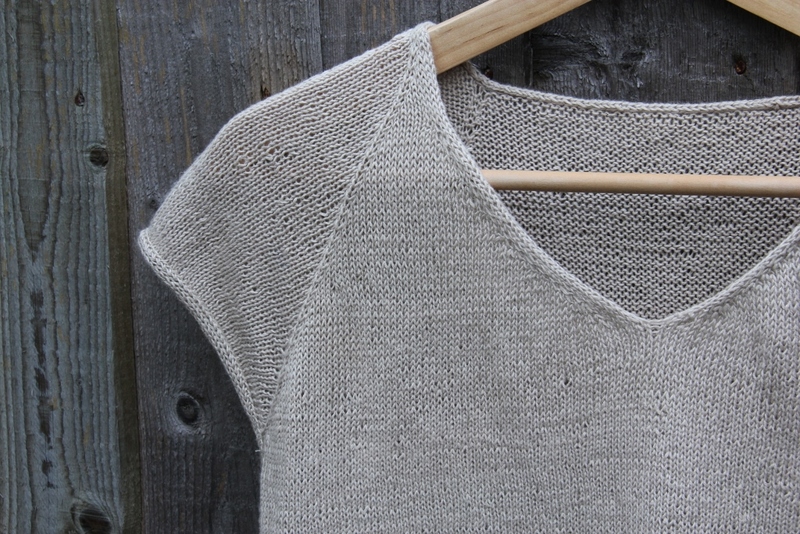 I love the idea of knitting with linen–and watching my yarn miles. I’d like to nominate you for the WordPress Family Blog Award… I love reading your blog and find your sense of colour and style glorious. It is plain and beautiful! You wouldn’t happen to have a “cheat sheet” that you made for this pattern, would you? I love the super simpleness of it and much prefer it to the original pattern! The sizing of the original pattern didn’t suit me at all, so I got the size right for this one purely by trial and error, in other words I didn’t do any maths or planning in advance, I just knitted (and unravelled and reknitted) until the size of the top half was right and the chest area fitted well, that’s the beauty of top-down knitting. The main differences to the main pattern were that I left out the neckline lace pattern, adjusted the size to fit me better and made the body more A-lined as that suits my body-shape better (in other words there was no shaping for the waist, I just made a few decreases just below the chest, then gradually increased the stitches towards the bottom). And I didn’t knit the sleeves at all, but just finished them with the i-cord bindoff straight after separating the sleeve stitches from the body. So it was all very spontaneous, making adjustments as I went along and, as I said, I didn’t write any of it down. So sorry to disappoint! Absolutely stunning! I will try! I hope my finish could be at least half nice than yours!